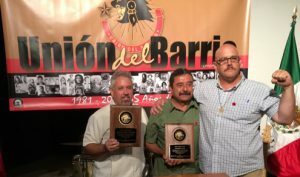 On August 27, 2016, Unión del Barrio celebrated our 35th year of continuous struggle for raza liberation. From 1981 to this day in 2016, tens of thousands, perhaps even hundreds of thousands of hours, invested into meetings, rallies, marchas, PE sessions, conferences, congresos, etc. – all stitched together to form a unified banner of struggle. We must never lower this banner, because it represents the incredible cumulative political experience that is UdB – and will continue to grow into a social and political force for revolutionary change. 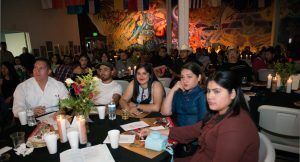 The Central Committee of UdB hosted the event at the Centro Cultural de la Raza in San Diego, California. 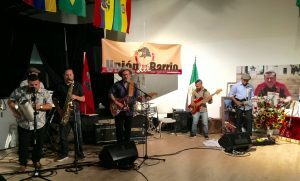 Over 250 people came together to mark the anniversary with political speeches, awards, video presentations, and music from the San Diego based group MAIZ. Below is the translation of keynote presentation of the evening, delivered by our Secretario General, Rommel Díaz. ¡Felicidades Compañeras y Compañeros de Unión del Barrio! ¡Hasta La Victoria – Siempre! Rommel Díaz, Secretario General de Unión del Barrio. Foto por Revografia. 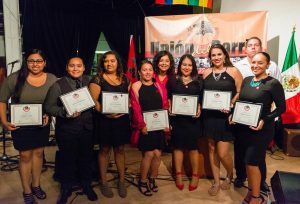 On behalf of the Central Committee of Unión del Barrio, I offer you a fraternal welcome to open this celebration that marks 35 years of struggle for Unión. On August 29, 1981, in the heart of the Barrio Logan, a small group of Chicanas and Chicanos saw the need to form an organization that could respond to the interests of our people. Among those founding members were Irene Cañedo, Jesse Constancio, Catalina Díaz, Luz Guillen, Howard Holman, Geno Jimenez, Leticia Jimenez, Juan Parrino, Rigo Reyes, and of course compañero Ernesto Bustillos. The founding of Unión del Barrio responded to the urgent demands of the Mexican people and the peoples of Nuestra América. Our people demanded the formation of a political organization that could survive the test of time, to develop independent political consciousness, and build an organization from within our own communities. That still latent demand – to break through the barriers of time in order to organize ourselves from within our own barrios – pointed to the urgent need to put forth ideas around which women and men could unite, advance educational processes that could elevate our collective consciousness, and bring our people closer to liberation. For these demands we have fought tirelessly all these years. Benjamín Prado y Christina Lares, Maestro/a de Ceremonia, y Comité Central de UdB. Foto por Revografia. Today, as we celebrate our 35th anniversary, we still hold to these ideas. We still struggle to build an organization that can emerge as a political party that truly represents our people, a party that can function as a vehicle through which we fight to liberate our people from the yoke of imperialism! Our current reality does not portend a future of happiness and tranquility. This present moment requires a strong and organized party. If this party is not consolidated, sooner rather than later, our people will inevitably be subjected to increased suffering and repression. Should we move too slowly, the social costs will be greater and more painful. This is not what Unionistas want our future to be about. Thus, we are committed to the idea of building a revolutionary party as soon as possible. Adriana Jasso, Comité Central de UdB. Foto por Revografia. We will not build an electoral party, although we do not disqualify electoral struggle as one potential area of work. We intend to build a party focused on the total liberation of our people from the yoke of colonial and imperial power. Ours will be a party that is of the people, and for the people. A party that can defend our communities, and guide our work, while on the path of emancipation, providing clarity for the intricate social and political struggles we will face along the way. This will be our own party to build true democracy, justice, peace, liberation and socialism – from the ground up! 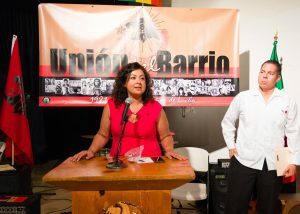 On August 29, 1981, when Union del Barrio was founded, among the Chicanas and Chicanos who were gathered there, was compañero Ernesto Bustillos, or Neto, as we affectionately called him. Neto was a leader in the ranks of Unión del Barrio until his last day of life. Though Neto left us physically, his legacy remains – as has been said, people pass on, but their ideas remain. This is what the members of Unión del Barrio hold to now. We raise the flag left by comrade Neto, and we carry it forward into our daily struggles. With his legacy we continue to strengthen our organization, to truly make it a party of the people! As we celebrate this 35th anniversary, we are also months away from the United States presidential elections. In recent months we have all been witness this empire’s electoral process. We see every day how the word “democracy” so easily pours out the mouths of pundits and politicians during what can only be called an electoral circus. Helena Rodriguez – Comité Local Francisco Villa de San Diego, y Ron Gochez, Comité Local Patricia Marín de Los Angeles. Foto por Revografia. We know that within this nation, there is tremendous inequality. We also know that inequality erodes democracy. We must then ask, in a nation where there exists such tremendous economic inequality, how can democracy exist? In a country where wealth distribution is completely unequal, where less than one percent of the population owns the great majority of the economic pie, we question its democratic credentials. Clearly, there can there be no democracy. What is the relationship between democracy and inequality? Inequality leads to the concentration of wealth within a tiny percentage of the population. This concentration of wealth leads to concentration of political power, and this concentration of power leads to the control of elections, and the manipulation of the vote to further expand this same political power. As a result of this management and mismanagement of the electoral process, this minority group can literally place men and women in the legislative, judicial, and executive branches of government – and they select people who ensure their interests. Not the people’s interests, but the interests of corporations or, put in another way, to ensure the interests of those who already hold power. Control of the three branches of government – the executive, legislature and judiciary – consolidates and accelerates the concentration of wealth and power, within the hands of the minority group. As a consequence of this process, the minority group and their corporations defend this concentration of power… And so we have the never-ending story. Emulaciones “por su destacada contribución al desarrollo político y organizativo de Unión del Barrio…” Foto por Revografia. We are now experiencing this vicious electoral cycle, within which no transformation of political power is possible, and therefore, it is impossible for people to secure political victories, or substantive reforms from within this electoral machine, i.e. no change is possible through voting alone. Thus, what we live under is not a democracy. This electoral circus, which ends next November, has nonetheless been a bit different than previous ones. It offers no political change whatsoever, but the circus – the performers in the circus – are acting differently. In this circus we have seen two phenomena, one motivated by Bernie Sanders, the presidential pre-candidate who is proclaimed a “socialist,” but is now not as socialist as before, because with one speech he fell in line to support the candidate Clinton. With Sander’s decision, he turned off the flashing lights of achieving socialist change through electoral struggle, which motivated and ultimately confused so many people. This was the Democratic Party circus for 2016. Republicans had their own circus performers as well. In this circus, the Republicans brought to the forefront the second odd phenomenon of 2016 – an unusual character extracted from the darkest corners of corporate America and reality TV: Donald Trump. Trump, and his political-cultural movement we call “Trumpismo,” has taken people in the country far beyond unusual behavior. The ideology that trumpismo drags behind it is a serious threat to peace, and is even a serious threat to the bourgeois democracy of the elite, not only in this country, but worldwide. For this reason, Unión del Barrio calls on all people to block the advancement of Trump and Trumpismo whenever possible. We must do what we can so that Trump does not reach the White House. Still, we will not surrender our political principles in our fight against Trumpismo. We harbor no illusions about the Democratic or Republican Party circus – the only path to democracy is by disrupting the vicious cycle that directs increased concentrations of wealth into the hands of a small minority. The only way to disrupt and ruin this vicious electoral circus, is by building a revolutionary party by the people, and for the people! For this reason, we have taken to the streets throughout Southern California, and on multiple occasions we have unmasked this two party circus that endlessly seeks to convince people that it is a democratic process. Throughout Southern California, we have actively rejected both the Democrats and the Republicans. For 35 years we have survived a parade of presidents, both Republican and Democrat, and we have nothing to say about which one was better – if anything we can only refer to how bad each of them was, compared to the other. Talking about the worst of the worst – our 35th anniversary places us in the final months of Obama. Barack Obama, despite being the first non-white man elected to occupy the White House, was among the worst presidents in relation to the well-being of our communities. During his first presidential campaign, this man was presented as an alternative – a force for “change.” 8 years later, and his government not only dropped any plans to regularize the immigration status of men, women and children who work and live in this country, but instead deported 2.8 million of these men, women and children, and by the end of the fiscal year this figure will reach three million. Indeed, this was a change, because his predecessor, George W Bush, never even dreamed of deporting so many people during his 8 years in office. Obama is the president who has initiated and/ or intensified more military conflicts than any other president in this country; this is also historic. Recall that in a 2009 speech, Obama expressed his desire to better relations between the United States and the Muslim world. Since then, Obama attacked six countries of the Muslim world: Afghanistan, Iraq, Libya, Somalia, Yemen and Syria. Yet, we cannot say that Obama did not in fact change some things. In Afghanistan, 30,000 soldiers who remained in the country at the end of the W. Bush administration have been increased to 90,000 under Obama! 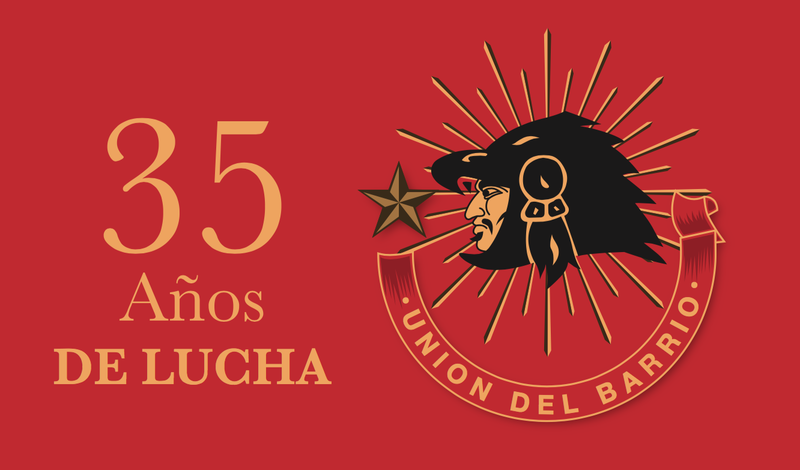 ¡35 Años de Lucha Continua! Foto por Revografia. We have also seen changes from Bush to Obama in relation to the deployment of military drones – these unmanned aerial vehicles (UAV) controlled from the comfort of secret bases located thousands of kilometers from their targets. The Bush administration conducted 49 such attacks with CIA drones in two countries: Pakistan and Yemen. One in Yemen and 48 in Pakistan. By comparison, Obama, under his tenure (we can’t know if in the remaining months this number will increase), is responsible for 328 such attacks in Pakistan and 99 in Yemen, for a combined total of 427 attacks. Almost ten times more than his predecessor! So, yes, Mr. Obama has indeed brought some change! Repression and racism is alive and well in the belly of the imperial beast – in spite of the fact that Obama himself is non-white. Independently collected data suggests that, in 2015, there were 1,134 cases of police involved killings. The vast majority of those people killed were young men, between the ages of 15-34, and most were of African origin. There are no firm numbers because federal and state governments refuse to keep this data. And of course, among these cases, not a single police officer has been prosecuted, let alone convicted of any crimes. The change that Obama offers in these cases is impunity for those guardians of the interests of large corporations. I could go on talking about Obama’s “changes,” but perhaps it serves us to touch on other issues, which in one way or another, are not far from the influence of imperialism. 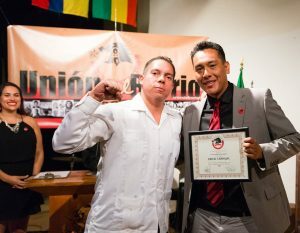 Unión del Barrio recognized our internationalist responsibility very early on in our history. Living within the belly of the imperialist beast, we assumed the task of contributing towards the unity of our movement with the liberation struggles of all people who resist imperialism. Our political identity, influenced by the emancipatory processes of our people’s history, requires us to be internationalists. For this reason, Unión del Barrio has been present in the political and social struggles of the peoples of Nuestra América. 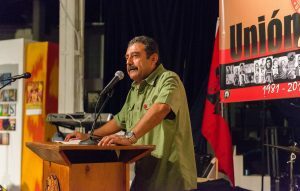 To be an internationalist in an era of a globalized economy, means contributing to the efforts of those leading the fight to build a united and socialist Nuestra América. In recent years we have witnessed a people’s offensive to capture state power, and build Participatory Democracy throughout the Nuestra América. We have witnessed the rise of organized struggle that has assumed the role of governing, and reoriented the function of governments, previously in the service of capital, towards a state that functions in the interests of the people. 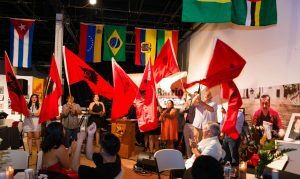 We have been in Brazilian lands on the occasion of the Congress of the Central Workers of Brazil; we witnessed the exemplary unity of the Uruguayan Congress of Inter-Union Plenary of Workers – National Convention of Workers (PIT-CNT). We’ve met workers in Bolivia, Peru, and Ecuador. At the invitation of the National Union of Social Security Workers (UNDECA), we participated in the Social and Cultural Meeting of Social Movements for Latin American Integration that took place in Costa Rica. We support the integration processes of the Community of Latin American and Caribbean States (CELAC); we marched down the streets of Panama with the Authentic Workers Federation, and participated in the People’s Summit with the World Federation of Trade Unions, rejecting the impositions of US empire and the Organization of American States (OAS). The example of Socialist Cuba, the Bolivarian Republic of Venezuela, Ecuador’s Citizen Revolution, and the revolution of the Plurinational Republic of Bolivia, each has been at the forefront of a shift towards continental integration, based on the principles of socialist solidarity. The emancipatory project of the Bolivarian Alliance for the Peoples of Our America – Trade Treaty of the Peoples (ALBA-TCP), created in 2005, by Presidents Fidel Castro of Cuba and Hugo Chavez of Venezuela, aims to build a regional bloc of power that is the antithesis of the predatory, neo-liberal economic model. ALBA represents one aspect of the future liberation of our peoples. It is this example that strikes fear into imperialism. This is the reason why we see the empire intervene and act against progressive and revolutionary governments who decide to join this continental alliance. Promoting political destabilization and economic war, in alliance with the oligarchy within these countries, imperialism tries to utilize now infamous “soft coups” to overturn progressive and revolutionary governments. In some instances they have succeeded, such as in Honduras, Paraguay, and Brazil. In the case of Brazil, this was especially urgent for imperialism because that country plays a role in the economic alliance known as the BRICS (Brazil, Russia, India, China and South Africa). The right wing counter-offensive cannot be ignored. We must realize the responsibility we have, as Mexicans and Latin Americans living within the US, to fight for an end to US intervention in these countries, precisely because we find ourselves situated within the political borders of the empire. 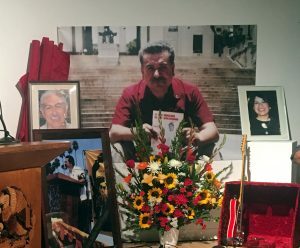 Our struggle for national liberation and socialist reunification with Mexico requires us to extend our contacts, and work beyond the political boundaries imposed on us. We have not been absent from the popular struggles in Mexico. Throughout the years, we have joined and supported popular movements in Mexico. 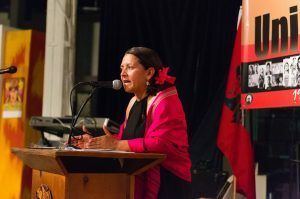 In 2010 we participated in the Trade Union Meeting of Nuestra America that took place in Mexico; we expanded our efforts to support the Mexican Electrical Workers Union, the teachers of the National Coordinator of Education Workers, and the miners, and we were present at the founding congress of the Nueva Central de Trabajadores. We also supported the Workers Alliance in San Quintín, accepting the leadership of the Frente Popular Revolucionario and the Bi-National Front of Indigenous Organizations. We want to take this time to honor one of the greatest revolutionaries that has left a defining influence on us, and has inspired us throughout the decades. We refer to Fidel Castro, who on August 13th of this year celebrated his birthday. Fidel is a symbol of struggle for Nuestra América and the world. A symbol that was able to confront the US; who was able to confront the empire, confront the powerful economic interests of an empire. A symbol that was able to create a new world, a different society that has been able to change the future of a country. In honor of his political career, for all of his contributions to social struggles and humanity, Fidel is one of the giants in world history. He is a 20th century giant, and continues to be one in the 21st century. From here, within the US Empire, we wish you a happy birthday Fidel! Long live Fidel! Long live a free and sovereign Cuba! Comrades – since we are talking about Fidel, on our 25th anniversary and in our 30th anniversary we remembered what he said about the revolutionary commitment. We repeat it today: Fidel said “it is not for revolutionaries to sit in their doorways of their houses waiting for the corpse of imperialism to pass by.” To honor these words spoken by Fidel, we should not take the path of indifference. We must not think of ourselves as independent of these historical situations. We must decide once and for all, to take on the fight against those who will destroy humanity. Our only hope for winning this fight is by joining an organization that struggles for liberation from capitalism, for peace, and for true democracy. That is why within Unión del Barrio we are clear, that the only solution is to build a strong party that is able to create a social movement, based on justice and peace. We believe that self-determination is the primary focus of our struggle, and liberation from the capitalist system is our goal. That is why Unión del Barrio is committed to building this party, a party that will guide us towards socialism – the only possible solution to the global crisis that seeks to overwhelm us! This is our commitment and this is our task, compas! Finally, on behalf of the Central Committee of Unión del Barrio, we salute each of our members who have gathered here today, as well our members who, for various reasons, were not able to be here tonight. I want to greet our comrades from Los Angeles, who by the way, celebrate a decade of struggle and work in that immense city – providing Unión del Barrio an unquestionable space of social and political significance in LA! We also welcome the comrades of San Diego, who for 35 years have maintained our collective struggle, who never stop organizing, and who never stop working in defense of our people. We also welcome the newly formed base in Davis, in northern California… We extend a warm greeting for the compañeras that have joined Unión, and who are present here tonight. We salute each and every one of you that is present here tonight. We thank you for your participation and commitment. Each and every one of you is indispensable! On behalf of the Central Committee, we also salute, in the most affectionate and fraternal way, the African People’s Socialist Party (APSP), which has been our ally for so many years and through so many struggles. Actually, this year we celebrate 30 years of political alliance with the African People’s Socialist Party. We extend a warm greeting to Chairman Omali Yeshitela, who was not able to join us today. We also salute all the allied organizations and collectives that are represented here tonight. We welcome you, your families, our families, and our friends and allies who have supported us during these 35 years of struggle. ¡On Behalf of Unión del Barrio – Un Gran y Revolucionario Abrazo! ¡Que Viva México! ¡Que Viva Nuestra América! ¡Que Viva Unión del Barrio! This entry was posted in 2016, Analysis, Analysis, Border Related News & Events, En Español, Event, History, History, Local Community News & Events, Los Angeles News & Events, Nuestra América, Organizational Updates, San Diego News & Events. Bookmark the permalink.